After hotel pickup from selected Tokyo hotels in the morning, depart from Hamamatsucho Bus Terminal by comfortable coach. 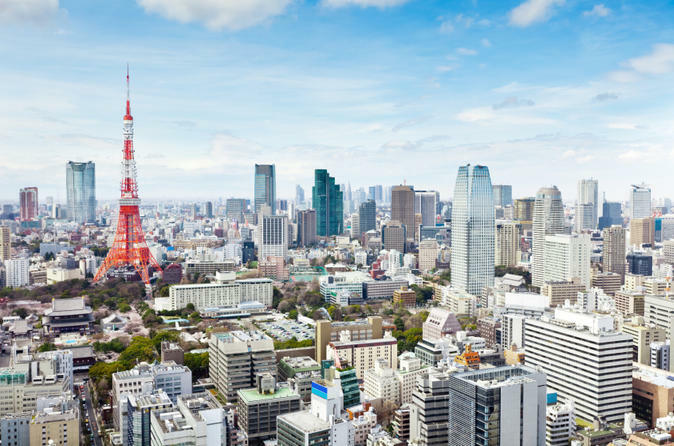 Each stop during your full-day sightseeing tour of Tokyo takes approx. 30-40 minutes. Next, you’ll appreciate nature from every angle as you take part in a traditional tea ceremony. While you sip tea, admire bonsai trees in the Japanese garden, which has carefully preserved the lovely Edo-style ambience throughout the centuries. After a Japanese-style lunch, your guide drives you past the Japanese Capitol (House of Parliament). Make a brief photo stop at the plaza in front of the Imperial Palace, and cross the symbolic, double-arched Niju-bashi Bridge, which originally led to Edo Castle (aka Chiyoda Castle) before fires destroyed much of its wooden structures. Hear how the emperor of Japan claimed the site as his official residence in 1863. When you reach Hinode Pier on Tokyo Bay, embark on a boat ride to Asakusa. Your 40-minute river cruise passes beneath a total of 12 bridges on the journey along the historically significant Sumida River. Upon arrival, follow your guide on a walk along Nakamise shopping street, a narrow, paved promenade crammed with traditional food and souvenir shops leading up to Asakusa Kannon Temple (also known as Senso-ji). Take a guided tour of Tokyo’s oldest and most significant Buddhist temple, whose history spans more than 1,300 years. Finally, enjoy a drive through Ginza, Tokyo's most luxurious shopping district, filled with towering department stores and a vast variety of brand-name shops. Before drop-off at Tokyo Station, you'll receive a souvenir map of Tokyo to help you explore the exciting city on your own.